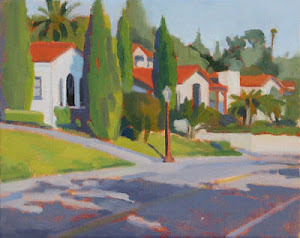 This small painting shows a street in Capitola called Monterey Ave. 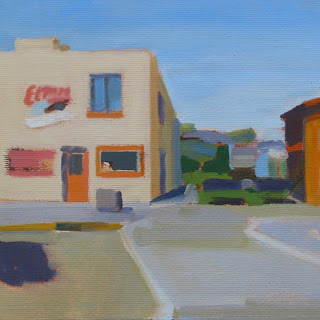 The yellow building on the left is El Toro Mexican Restaurant and in the middle of the painting is a grassy area called "Lawn Way". I liked the contrast of the buildings against the lawn and landscape in the distance. I also liked the weird angles of the cross walk that draw you into the composition.